With no particular reason except my own interest, I gladly highlight 3 papers I found interesting (so far, reading one paper at the time, whenever possible so lot of time to read still). The paper on "mobile learning through indigenous languages: learning through a constructivist approach" written by Mmaki Jantjies and Mike Joy was a treat to read. With their research they provide a possible solution to work around bilingual students (in this case African languages) and how this can be used to increase learning overall by allowing students to support themselves and use multilingual communication through mobile devices, and at the same time allow teachers to create solutions for the bilingual challenges. In the study learners created their own audio based bilingual learning material on mobile phones using a constructivist learning approach, in the subject area of physical science. A total of 32 high school learners and their teacher from a South African school participated in the study, and though semi–structured interviews and questionnaires learners reported on their experiences. Infrastructure challenges, including limited access to free electronic resources, and slow and expensive Internet access, became the main hurdles in supporting a constructivist learning environment. The mobile learning process however gave learners an opportunity to create their learning content in their own languages at any location at any time, and use the content later for revision. The audio option is key here (I think) as this allows people to work around writing as well. To me, it is easier to share French or German audio than to write in both languages, when I was a student an audio option would definitely have gotten me to support my peers more than only having a written option. 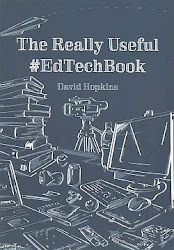 This got me thinking about the lack of mobile OER again... will get to this in a later post. 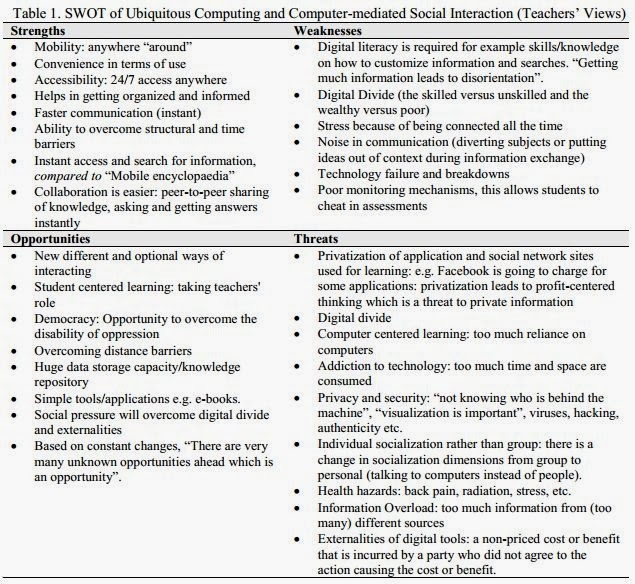 The paper by Edgar Napoleon Assiimwe and Sana Zubair Kahn on the topic of "Ubiquitous Computing in Education: A SWOT Analysis by Students and Teachers" immediately appealed to me as the idea of doing such an investigation is so needed! So, got reading. When going through all the strengths, weaknesses, threats and opportunities, I immediately found myself acknowledging many of them. "I am not alone!" immediately came to mind and that gives a good feeling. The paper provides an immediate overview of the SWOT analysis as provided by teachers and students and that very simple list of ideas provides an insight in what keeps all of us busy. So copied one of its tables here as the picture to lead this blogpost. The nice thing is that comparing both, you can see that students and teachers often have the same basis that leads to the SWOT elements. And a heart warming opportunity coming from the student list of opportunities: "Cultural or political differences are overcome/ solved". That is a VERY nice read! Another paper I found of interest was the "Integrating Interactive Videos in Mobile Learning Scenarios" presented by Dan Kohen-Vacs, Marc Jansen and Marcelo Milrad. My interest for reading this paper was ignited by my own wish to embed more fluent interactive video in mobile learning options as part of a seamless mobile pedagogy. Enabling interaction in a multiple device learning environment is quite challenging and these people seem to be able to come close to actual seamless engagement (nice!). Idea is simple: small video sizes (enabling download or streaming), short questions within video content (waiting for a response of the learner) and ... on to the next bit of (mobile) content. The authors provide a nice flow of the learning activity and the approach has been tested during 2013 on approx. 100 students in academic courses offered by 2 universities. But although the approach is promising and the need for this type of seamless learning is clear, challenges stay multiple. Looking forward to the future research building upon this. If you have, at any time, wondered how to react when some of your content was picked up without being cited, this is a nice video to view as you are reflecting on the topic. The presenter is the wonderful Sophia Mavridi talking about digital plagiarism versus digital citizenship, a war of words. It is a wonderful overview of thoughts, cultural concepts on plagiarism, factual student realities, self expression and identity, privacy, self mediation, and ... content repetition. The content is of interest, but at the same time it is also interesting as it is a workshop recording. So in a way, you can enter the actions of this workshop after the actual fact. Though some editing might have cut out the group discussion and enable optimal use of time for us the viewers. But still, fun idea. The recording makes you reflect on plagiarism, but there are various factors linked to plagiarism: human cultural (copying an author can be seen as an honor in some regions), academic mark (plagiarism is seen as a negative practice), cultural acceptable practice (copying narratives for plays, songs - covers, ... goes back to Roman times and is accepted). With new plagiarism tools (name is indicative for our perception of copying other people's work), detection is increasing. 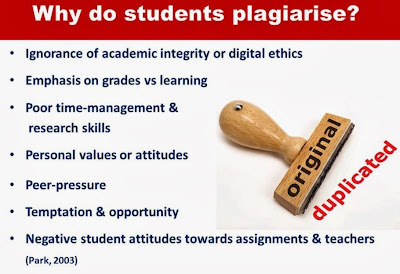 On the other end, there are still opportunities for plagiarism to be un-detected (translating from other languages is one, or rewriting...), and there is the conscious or accidental plagiarism. Sophia also remarks that sometimes grades are more important than learning, making plagiarism more attractive to get good grades (students doubting themselves, lack of time, or simply not knowing how to write something). Digital citizenship is put forward as a solution. So what to do with this idea? Maybe it needs to be redefined, maybe personally given a place in the broader scheme of things? If I want to make a difference, surely everyone is free to use what I say for their own goals? My name is irrelevant to changing the world? In fact if any detail that I can come up with would indeed have the potential to make a positive change, than this would indeed be AWESOME already? So way should I care about my name? If someone uses content I have built, surely that can only be seen as Open Educational Resources being reformatted (or not) and as such - being a propagator of open education - I must be all for it? My name - again - would not matter? Jeff Cattel is the editor of Corporate Learning Network and he - and the rest of the wonderful CLN team - gets people together talking about new corporate learning options and all-round new tech-based training options. He is a one man driving force and as such it was a pleasure to write an article on MOOC and corporate / non-profit options. In the article I touched on three basic options for non-profit/corporate MOOC implementation: expert learning, knowledge marketing and professional knowledge strengthening. 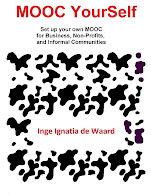 The article is entitled MOOCs are about to shake up the corporate and non-profit world, and can be read here. What to research? Seamless learning or self-directed learning in MOOC? There is a bit of a fork in the road with my PhD research. I can feel it. As data from my pilot study is seeping in, my head seems to want to tell me something, but the thoughts have not crystallized into conscious ideas yet. So yesterday I took my doubts to the public, that is to say: I proposed it to my colleagues and that already twisted my mind towards some new ideas (and I put some of the remarks they shared into the powerpoint below). But now I would like to hear your views as well. What would you research if you were me? In order to provide some background, slides were shared (see below). 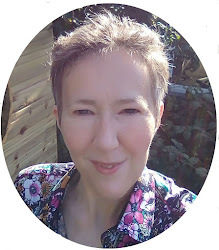 The setting: as I am looking at FutureLearn courses and how participants in mobile enabled MOOC self-direct their learning I am getting the feeling that I am missing an angle. Or that my mind feels like it is in need of something extra. Currently, I am looking for that extra in seamless learning. 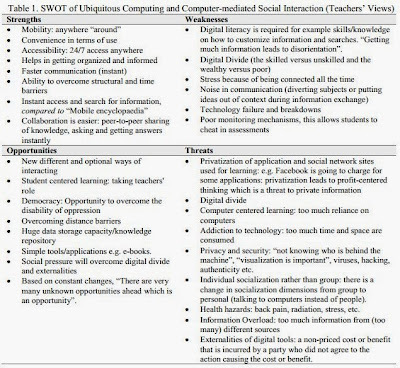 Mobile Seamless Learning has been put into a framework by Wong and Looi (2011) and it has some nice similarities with potential elements of SDL. As such I felt it worth exploring as a potential option for my main study (planned to start in January 2014). Still having to finish my last phase of data collecting of my pilot study, I do have some data from a pre-pilot and some intense literature to share with all of you (if you are willing to go through a rather big probation report on the matter, it is a rewrite, the final version as it was accepted by the probation examiners). I rewrote the probation report, and now it has sections on why I choose self-directed learning and not self-regulated learning, crossroads between online learning, mobile learning and MOOC, and of course a methodological section. The appendices offer research instruments (learning logs, informed consent form, ...) and the first findings of the pre-pilot. But the question currently is: whether to go for SDL or Seamless learning or ... maybe a mix. What do you think is the most thrilling (yes, nerd talking) research topic? Admittedly I have the longest way to go to even be in the shadow of Alice Munro, the newest Nobel Prize winner of literature. Nevertheless my heart jumped a beat when I saw that in the past she got the Canadian Governor General's Award for fiction (three times!!!) and this year I was very proud to get the Canadian Governor General Gold Medal award. I agree that my award is only a start to invest in continued academic work, while Alice Munro is a completely accomplished and wonderful writer, but still it gives me a good feeling to have something in common with a strong human being. And her book the beggar maid was a good read, now in dodgy, read condition sitting on my bookshelf. I did not dare to write about getting the Gold medal award from the Governor General at first, as I am a bit uncomfortable with sharing accomplished work at times. But, today I thought I would just share it, because the gold medal really did give me a boost to make a difference with my future distance education work and projects. 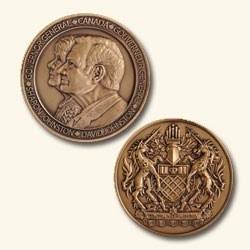 The Governor General’s Academic Medals have recognized the outstanding scholastic achievements of students in Canada for more then 125 years now. And I am a proud graduate student from Athabasca University. The medal which I was granted to receive is awarded to the student graduating with the highest average from a university program so it is a real honor to get the award. Prizes sometimes matter on a personal level. For one my parents were really proud of me, and my nephews and nieces patted me on the shoulder expressing enthusiasm which really means a lot to me (and surprise that gold medals are also given to non-sporty people). It means a lot to me, also because I am well passed the average graduate student age (46 at present). So although my roots are Flemish and my family and I live in the United Kingdom at present, I say: Go Canada! The latest version of the International Review of Research in Open and Distance Learning has just been published and as always it is packed with online, mobile and eLearning wisdom. There are a couple of OER related articles in this publication. One article that immediately got my attention was the OERscout technology framework by Ishan Sudeera Abeywardena, Chee Seng Chan, Choy Yoong Tham. They dare to tackle the relevant OER searching and finding challenge: as a major step towards solving this issue, this paper proposes OERScout, a technology framework based on text mining solutions. Just imagine finding the top-notch OER in a matter of minutes, what a wonderful world this would be. Deadline for papers for Ninth International Conference on Networked Learning in Higher Education, Lifelong Learning and Professional Development is Friday 4th October. The conference is hosted by the University of Edinburgh, at the John McIntyre Conference Centre in Edinburgh, on the 7th. 8th & 9th April 2014.Keynote Speakers: Professor Neil Selwyn & Professor Steve FullerThis conference is considered a major event in the international 'technology enhanced learning' conference circuit, and provides a friendly, collegiate context for meeting researchers and practitioners in networked learning. eMOOC conference 10 - 12 February 2014 - Lausanne, Switzerland. eMOOC conference in Lausanne, Switserland. Deadline for submitting papers: this Friday. The organisers of the European MOOCs Stakeholders Summit 2014 have extended the deadline for paper submissions to October 4, 2013. The conference will take place in Lausanne, Switzerland, on 10-12 February 2014. · The Experience Track is focused on experiences and best practices from practitioners in MOOCs or MOOC-related contexts. Papers in this track should focus on concrete experiences within an institution that have transferable lessons to share with other practitioners. · The Research Track aims to feed the general debate on MOOCs with scientific data. These research papers should address a solid research question, employ appropriate research methods, and provide data-based results. EMOOCs 2014, organised by the École Polytechnique Fédérale de Lausanne (EPFL) and P.A.U. Education, will see researchers, practitioners, and educators come together to collectively shape the evolution of MOOCs in the sphere of European higher education. 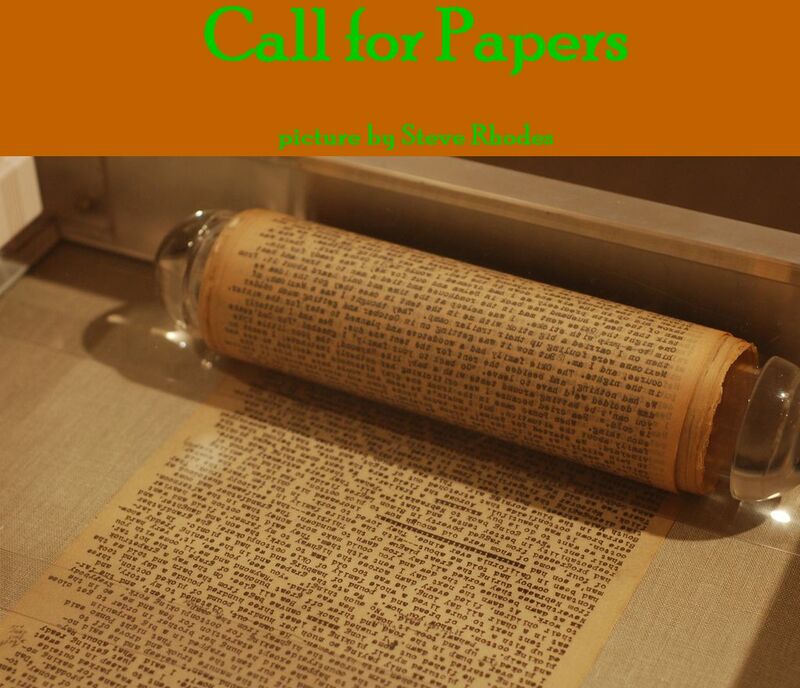 Please, see the conference website for more information and for guidelines to submit a paper.